EFR FIRE & SAFETY is now offering you the most technologically advanced Escape Hood Respirator on the market today! Now, you can be assured that you and employees have the best chance for escape from a terrorist situation, natural disaster, or industrial accident with this cost-effective American-Certified Hood/Mask Escape Respirator. Super Small Packaging to bring with you wherever you may need it! ​ iEvac® is the only Smoke/Fire Hood certified to the American Standard ASTM E2952-14. 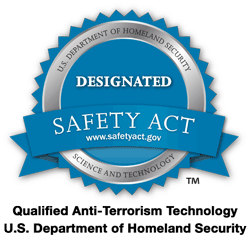 In addition, the U.S. Department of Homeland Security has designated the iEvac® as a Qualified Anti-Terrorism Technology. ​​iEvac is currently being used nationwide by federal, state, local government agencies, all branches of the military, Fortune 500 companies, transit authorities, sporting arenas, marine, aviation, hospitals, homeowners and more. ​Why do employees need respirators? How much does the iEvac® weigh? Will the hood material melt on my face? • The iEvac® Hood can withstand up to 1700° F of radiant heat. Will I be able to hear emergency personnel through the iEvac® hood? • Yes, you will be able to hear them speak and they will hear you too. How will emergency personnel find me if the power is affected and the lights are off? • The iEvac® Hood has high visibility reflective strips for easy recognition. Will the hood fit over long hair and glasses? • Yes, the iEvac® hood will fit over long hair, glasses, and beards. Is the iEvac® difficult to put on? • No, the iEvac® dons in less than 30 seconds. What seals out harmful toxins? • The iEvac® has a silicone neck dam which provides the highest level of protection. Will I be able to see where I’m walking while evacuating? • Yes, the iEvac® Hood is a clear material resulting in an unobstructed field of view. Will I be able to breathe comfortably while evacuating? • The iEvac® Hood has twin cartridges for easier breathing. 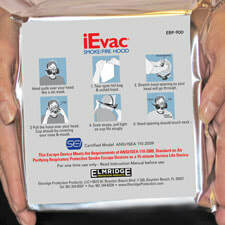 • The iEvac® Hood will provide up to 45 minutes for a safe evacuation from carbon monoxide. Is there any equipment maintenance required? • No, the iEvac® is maintenance free. How much time will I have to evacuate from an emergency situation? What is the shelf life of the iEvac® Smoke/Fire Hood?